“Amy, I need you to sit down,” said the voice over the telephone. It was my sister calling. When a conversation begins that way, it’s never good news. My brother had been in a motorcycle crash, and was being flown to a local Shock Trauma unit. Nobody was sure that he would survive his injuries on the way. I jumped in the car, picked up my sister who lived nearby, and headed to the hospital. We drove by the crash scene on the way to the hospital. I saw my brother’s overturned bike in the woods off the side of the road. Police officers, who were still documenting the scene, had cordoned off the area. A young man that witnessed the crash was still there. He told me that my brother struck a curb at about 45 mph, lost control of the bike, and flew 30-40 feet before landing in the woods. “Not good but alive and barely conscious,” was his reply. And, yes, the young man told me, he was wearing a helmet. I thought there might be hope. After all, I work at the NTSB as a safety advocate and I know that most motorcycle crash deaths are caused by head trauma – and helmets are a vital protection from that risk. Motorcycle helmets reduce the risk of head injury by 69 percent and reduce the risk of death by 42 percent. The National Highway Traffic Safety Administration estimates that helmets saved the lives of 1,630 motorcyclists in 2013 and that 715 more lives in all states could have been saved if all motorcyclists had worn helmets. Back in the car en route to the hospital, I felt an odd sense of deja vu. These feelings of extreme worry, sadness, and anger – anger at that stupid motorcycle – seemed eerily familiar. And then I remembered: my mom had also been in a motorcycle crash 12 years prior. When I entered my brother’s hospital room, his dented helmet was on the floor, and I touched it with reverence. If what I had heard from the witness and police were true, this helmet had, no doubt, saved his life. My brother has a long road to recovery. He suffered multiple fractures, of his ribs, wrist, and ankles; six broken bones in his back; a punctured lung and lacerated liver; and a long list of less severe injuries. But he is alive. Yes, I work for the NTSB. But I am also a big sister and a daughter. I’ve seen the kinship that riders feel with one another; now, after helping family members through the aftermath of a bad crash, I wanted to share our story with that extended family. Thankfully, my brother’s and mother’s accidents occurred in Maryland, a state with a universal law requiring helmet use. 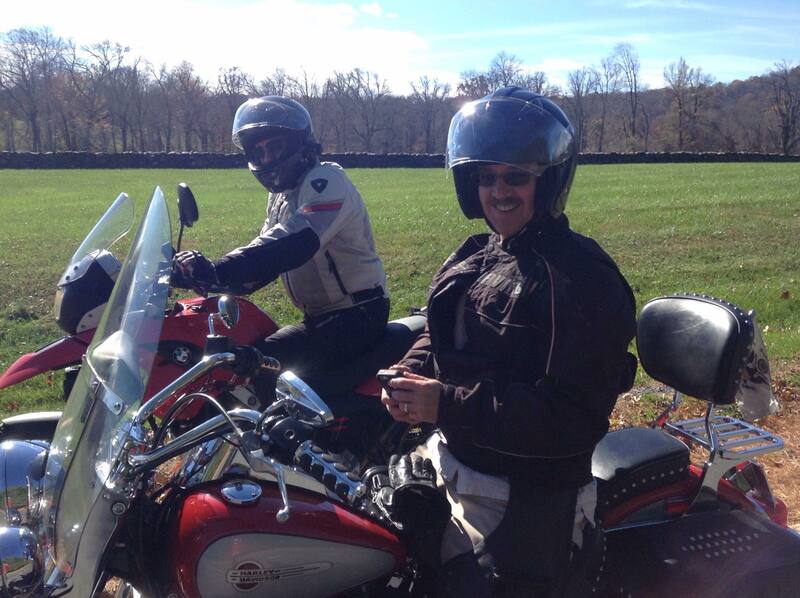 Currently only 19 states and the District of Columbia have laws requiring all motorcyclists to wear a helmet. Laws requiring only some motorcyclists to wear a helmet are in place in 28 states, and three states still have no law whatsoever. I have heard riders who resist helmets saying that helmets take away their freedom – and that they’re only taking a personal risk. But I know that most also have sisters or daughters or other family members. I know that they’re not taking that risk just for themselves. If you are thinking about riding without a helmet, think again. My brother and mother might have lost the feeling of the air upon their faces as they cruised down the road, but they gained something immeasurably more valuable: the feeling of air entering and leaving their lungs – ultimately, another day on this earth. And I gained having them both in my life. Amy Terrone is a Safety Advocate in the NTSB Office of Safety Recommendations and Communications. Chris O’Neil checks directions on his phone after safely pulling over during a pick up ride near Bluemont, Virginia. As a motorcyclist I’m keenly aware of the risk I accept every time I saddle up – whether it’s to run an errand around town, join the herd for an organized ride like Rolling Thunder, or to head out for a multi-state, multi-day solo ride – every time I take to the road on two wheels I’m thinking about how I can limit or mitigate the risks associated with my passion for riding. As an employee of the world’s premier accident investigation agency, the National Transportation Safety Board, I’m equally aware of the need to share the word about safety during Motorcycle Safety Awareness Month. Distracted or impaired drivers, drivers who change lanes without signaling and drivers who simply don’t “see” motorcyclists, are among the many risks, over which motorcyclists have little control, which we face each time we mount up. It’s therefore critical that motorcyclists focus on eliminating or mitigating the risks we can control, the things we can do to avoid or better survive an accident while riding a motorcycle. In broad terms it means gearing up, clearing up and staying heads up. You have to gear up, every time, every ride. That means over the ankle boots, riding pants or chaps over jeans, a leather or textile jacket, full finger gloves, a DOT approved helmet and eye protection. There really is something to the saying, “dress for the slide, not the ride.” Top siders, shorts and a T-shirt might be comfy and well suited for your post ride activities, but that kind of attire in no way protects you – not even from a sunburn, much less road rash – while on your motorcycle. Yes, I get hot in that gear during the sweltering Virginia summers, but I’d rather be sweaty for a while, than suffer a long recovery from road rash if I’m involved in a crash. Plus, I’ve found, those big beetles, cigarette butts, and stones sting a bit less when you’ve got the right gear on. Distracted driving is creeping into the world of the motorcyclist and it’s not always the fault of the other drivers. The ability to incorporate the same technology found in automobiles, such as GPS navigation, CB radio, Bluetooth for cell phones, and other multi-media entertainment, continues to increase and with the added bells and whistles comes the potential for distracted driving. Consistent with the NTSB’s call to Disconnect from Deadly Distractions — a 2016 NTSB Most Wanted List issue – I make sure I clear up from all distractions when I ride, and I advocate for others to do so. When we ride, we need our senses – sight, smell and hearing – to work together to warn us of danger. Those senses don’t work as well if our mind is focused on a GPS display, the music thumping through earbuds or speakers, or a phone call. Riding a motorcycle offers you a unique state of mind that is free of the distractions of day-to-day life. Why then would you want to clutter up that moment with potentially deadly distractions? Don’t add to the distracted driving problem – before you saddle up, gear up and then clear up. With our body properly protected, and our mind properly focused, we’re ready to ride our properly equipped and inspected bike. Once we are kickstands up, we have to be heads up. What I mean here is all throughout our ride, regardless of setting, we have to plan for the unexpected. “Where will I go if that car pulls into the intersection? Where is my escape route if this car comes into my lane? What’s on the other side of this blind curve? What’s on the other side of that hill crest? Do I have enough distance between me and the car ahead of me? What if the car coming up on me from behind doesn’t realize I’m stopped for a red light?” Being in the moment of your ride includes thinking about and planning for the unexpected. Riding defensively requires you to think 12 seconds ahead, anticipate what could go wrong, and to formulate a plan to deal with the threat. When you’re free from deadly distractions, it’s easy to be heads up and still enjoy your ride and be in the moment. Whatever you ride, wherever you ride, whenever you ride, embracing the principles of Gear Up, Clear Up and Heads Up can help keep you safe while enjoying the greatest form of transportation. Want more tips on motorcycle safety? Check out the Motorcycle Safety Foundation’s site at http://www.msf-usa.org. For information about the NTSB’s recommendations to improve motorcycle safety visit http://www.ntsb.gov/news/events/Pages/150.aspx. Chris O’Neil is Chief of the NTSB Public Affairs Division. Happy Bike to Work Day! Bike to Work Day (#BTWD2016) is celebrated every year in May in cities throughout the United States and Canada to promote bicycles as a commuting option. I ride my bike to work almost every day—rain or shine. Although I have many forms of transportation available to me, I choose to travel by bicycle, not because it’s always the fastest way to get to work, but it is, by far, the most enjoyable. Sometimes I ride to a public transit station, other times I ride straight to the office, but I always feel lucky that I have this transportation option to get to my job at the National Transportation Safety Board. 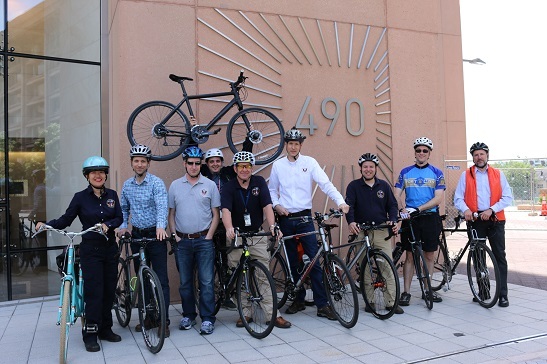 Some of my colleagues have been riding their bikes to work for years (you can see a few of them in this photo). They are ship, airplane, train, highway, and pipeline accident investigators. They are medical, communications, engineering, legal, and administrative professionals. While we all appreciate the different types of transportation, we also share a personal appreciation for bicycles as an important mode of travel. At the NTSB, our mission is to independently investigate accidents and to use the key findings from those investigations to help make our country’s transportation system as safe as possible—in all modes of transportation. And, as with all modes of transportation, traveling by bicycle has its risks. In the U.S., according to the Centers for Disease Control and Prevention, more than 900 bicyclists die and 400,000 go to an emergency department every year. We can design communities that are safer for both bicyclists and pedestrians, as we learned recently at the NTSB Pedestrian Safety Forum. We also can work to ensure that bicyclists are visible and that they always wear a helmet, which reduces the risk of head and brain injury by 63 percent to 88 percent for all ages, according to a systematic review of scientific literature. And we can all do our best to obey traffic laws and pay more attention to everyone who is sharing the road with us. The next time you see a person on a bicycle—whether you are in a car, walking, taking the bus, or riding a bike yourself—say hello or wave. It may be me or one of the good men and women at the NTSB who are working hard to keep our nation’s transportation system safe! During World War I, a young British officer named T.E. Lawrence helped to lead the 1916-1918 Arab Revolt against Ottoman Turkish rule, playing a critical role in defeating the forces of the Ottoman Empire. His exploits are immortalized in the film Lawrence of Arabia, starring Peter O’Toole. His role in the war is fairly well known. What is less known is how Lawrence influenced motorcycle safety. Lawrence was an avid rider, at a time when very few motorcyclists wore a helmet – a protection invented in 1914 but very rarely used. On May 13, 1935, he was riding his Brough Superior SS100 on a narrow road near his cottage near Wareham, England when he entered a dip in the road. This dip obstructed his view of two boys on bicycles, which he swerved to miss. He lost control of his motorcycle and was thrown over the handlebars. Like most motorcyclists of his day, Lawrence, age 46, was not wearing a helmet. He suffered serious head injuries and never regained consciousness. Six days later, he died. One of the doctors treating Lawrence was a young neurosurgeon named Hugh Cairns. After Lawrence’s death, Cairns conducted an autopsy and discovered that Lawrence had suffered “severe lacerations and damage to the brain” when his unprotected head struck the ground. Had Lawrence survived, brain damage would probably have left him blind and unable to speak. Cairns’s diary later revealed that it was Lawrence’s death that sparked in him a curiosity to study head trauma caused by motorcycle crashes. His efforts in this area would ultimately spur him to pioneer helmet safety research. Cairns speculated that thousands of motorcycle deaths in Britain could be avoided if riders’ heads were protected. And, in October 1941, the British Medical Journal (BMJ) published the results of his first study, titled “Head Injuries in Motor-cyclists – the importance of the crash helmet.” The study showed that, in the 21 months prior to the start of World War II, 1,884 motorcyclists died on British roads. In the 21 months following September 1939 (when England entered World War II), Cairns found that 2,279 riders died, an increase of 21 percent – despite the fact that gasoline rationing at the time had likely reduced the number of overall vehicles on the roads. Because helmet use was so rare, Cairns could only study a few motorcycle accident survivors who had worn helmets when they crashed. All of them survived. His research convinced the British Army that wearing helmets could save lives. In November 1941, the British army mandated that soldiers wear helmets when they traveled by motorcycle, and Cairns embarked on a study of the new policy’s effect. In his 1943 BMJ paper, titled “Head Injuries in Motor-cyclists, with Special Reference to Crash Helmets,” Cairns found that motorcycle fatalities in the Army had fallen from approximately 200 a month to 50 a month, a reduction of 75 percent. Hugh Cairns died of cancer in 1952, so he did not live to see the lifesaving changes that his research helped to bring about. In 1973, the British Parliament passed a law mandating that motorcycle riders use helmets, and, in 2013, the number of motorcycle riders who died on British roads was 331. This was a fraction of the annualized toll on British roads prior to Cairns’ research, despite a huge rise in traffic volume from the World War II era to today. Years before the NTSB or similar organizations existed, Cairns was already showing how the study of accidents can improve transportation safety. It took the death of Lawrence of Arabia, the career of a dogged and brilliant researcher, and countless subsequent actions to demonstrate the value of a helmet. This is one story from history we can – and should – all learn from, especially during this month of May, Motorcycle Safety Awareness Month. I made a statement in an NTSB board meeting this week that offended many. Through this message, I hope to convey my sincerest apologies. The board meeting was to deliberate on the January 12, 2015, accident involving Washington, DC’s Washington Metropolitan Area Transit Authority (WMATA) subway system. That accident claimed one life and sent many others to local hospitals. While I don’t mind taking organizations such as WMATA to task for their failings and oversights, I never intended to offend anyone with learning disabilities or their families. Looking back on it, it’s now clear to me how my words were offensive. I therefore want to offer my sincerest apology. Although I was quoting from a book, the words came out of my mouth and I take full responsibility for what I said. The emphasis of the statement was intended to be on the fact that WMATA failed to learn. However, tying that point to children with learning disabilities was wholly insensitive on my part. Clearly, I could have made the point without referring to learning disabilities at all. As much as I regret the offense I caused to many, I also regret that my comments may reflect poorly on the agency that I represent. As a government official who often makes public comments, I try to carefully choose my words; this time I failed. I endeavor not to make the same mistake I asserted WMATA was guilty of – failing to learn. I pledge to use this as a powerful learning opportunity. Five years ago, the NTSB held its first event focused exclusively on teen driver safety. The goal was to save lives by empowering young people to develop and lead traffic safety education projects, support law enforcement efforts, and advocate for effective legislation to protect teen drivers. Ultimately, we want to help develop youth leaders to be ambassadors for safety. I’m a Millennial, and I wear this as a badge of honor. There are hundreds of books, thousands of articles, and millions of opinions on how to best work with my unique generation. In ways, we’ve stumped our bosses because we aren’t motivated by traditional workplace incentives; instead, Millennials are driven by passion. We want to see the value in what we do. We want to know that our work is building to a better world. As I catch up with friends from college, we spend a lot of time talking about our careers. Many are in the private sector, building apartment complexes or managing stock options; others are in education, working on Master’s degrees, or attending medical conferences. I talk about my deep love for transportation safety. “Rick, what exactly do you do?” is a common question (that some of my friends and even my mother are still trying to figure out). My answer is simple: I have the best job in the world. As the director of Strategic Partnerships for Students Against Destructive Decisions (SADD), I work to build SADD’s capacity at all levels in order to fulfill our mission and build meaningful, lasting relationships. SADD was founded 35 years ago in the wake of a series of alcohol-related crashes that claimed several teen lives. The young people in Wayland, Massachusetts, rallied together to unite their voices and say “enough is enough!” They realized that if they were going to change the statistics, they themselves needed to speak up and act. Now, three-and-a-half decades later, SADD is a youth health and safety organization with thousands of chapters in middle schools and high schools across the country. I joined SADD in high school. My chapter was a safe space, where teens could be teens with others that shared a central set of values. To this day, I cherish these friendships. My junior year, however, our mission became very real as I lost a close friend in a horrific crash. Nick’s death changed my school, my community, and me. The tears we shed were completely preventable. Nick should have been in our Homecoming group. He should have been in school bartering with the lunch ladies, and he should have been six spots behind me at graduation. In that moment, the story of SADD became my story. I wanted no other parent, school, or teen to feel the loss we felt. In my freshman year of college, I was humbled to be selected as the SADD National Student of the Year. For the first time, I saw SADD turn from a passion into a real career option. I was fortunate enough to attend the NTSB Youth Open House representing SADD, where I networked with other youth leaders and professionals from across the country. In the room were dozens of committed professionals who found their way to transportation safety through a variety of paths. Yet, all shared a common thread: they loved what they did, maybe not every day, but their passion was rooted in a deep understanding of the problems they were solving. The traffic safety field is small enough to form meaningful acquaintances that blossom into life-long friendships, but it is large enough to always look toward the next frontier. I found a space that truly values me as a young professional and supports me in my personal and professional growth. In December 2015, the NTSB joined with SADD to launch a symposium event that expanded the definition of impaired driving. As I left the NTSB boardroom that day, I smiled. I realized that I was leaving the room where I decided to start my career. It all started with the NTSB Open House just a few years prior. I’ve taken my passion and turned it into a career. Now, as I work with youth leaders across the country, as the Director of Strategic Partnerships at SADD, I always make sure I mention how much I love my job. Why? Because you never know when the next great engineer, highway safety specialist, grant writer, public information officer, or advocate could be standing in front of you. You never know which SADD student could invent the next generation air bag, create the next highway safety slogan, or advocate for the next life-changing legislation. That’s what motivates me. What motivates you?